Our Penthouse Suite at Sunset Serenade is completely brand new as of December 2018. It is very impressive and waiting for you! 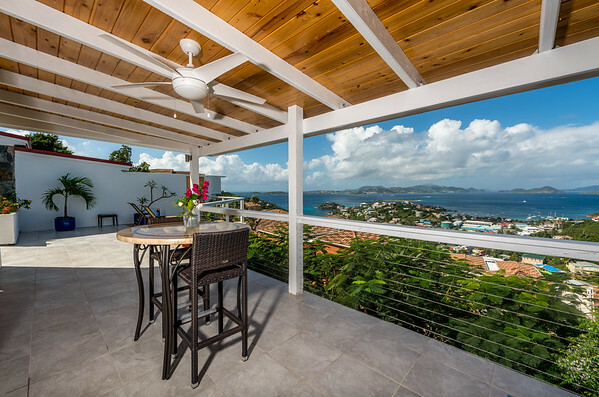 With nearly 1,000 square feet of outdoor living space, the Penthouse Suite offers its guests some of the very best views on all of St. John. 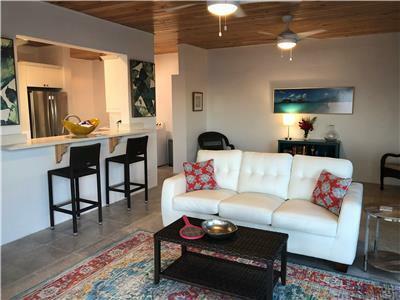 The Penthouse Suite at Sunset Serenade has an air-conditioned King bedroom, a large bathroom with a walk-in shower complete with water views, a full size kitchen, and a living space that has a pull out sofa with a Westin Heavenly bed. 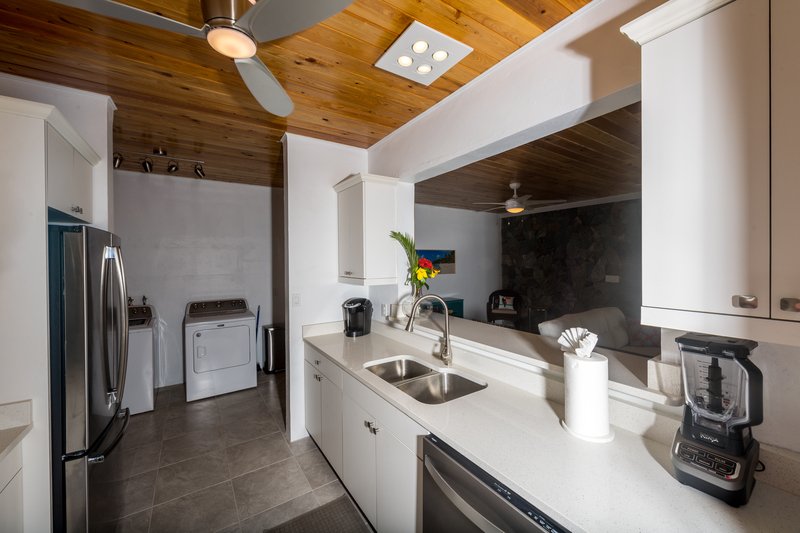 It even has a dishwasher and washer/dryer, two amenities that are hard to come by in our little slice of paradise! The Penthouse Suite has brand new, chic and comfortable furniture both inside and outside on its three oversized decks. 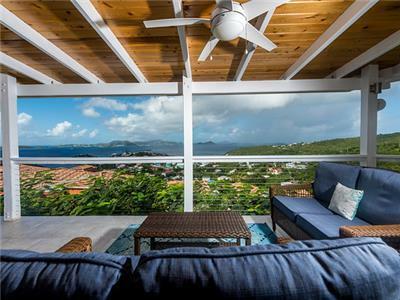 Speaking of the outdoor living space, the Penthouse Suite has incredible daytime and sunset views overlooking St. John and out toward St. Thomas and the surrounding cays - all of which you can enjoy on the deck while sipping on a coffee in the morning or perhaps a cocktail at night. Whether it’s morning, noon or night, we promise the Penthouse Suite’s views will leave you breathless. When staying with us, you will have everything you need for an unforgettable vacation right at your fingertips. This includes coffee for your mornings, beach towels, beach chairs and a cooler for daytime fun, and comfortable outdoor furniture for you to lounge on at night. 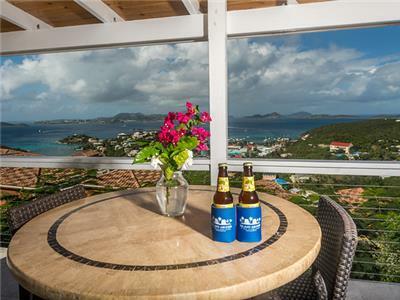 The Penthouse at Sunset Serenade is the choice for travelers looking for understated luxury, comfortable accommodations, and incredible views all while being close to the shops, restaurants and bars in Cruz Bay. We can almost guarantee that you’ll love the Penthouse Suite so much, you’ll be booking your next trip before the ferry leaves the dock! The Penthouse was great, the view was great. Was easy to book and all the directions are laid out. The kitchen perfectly stocked with great pans and dishes. 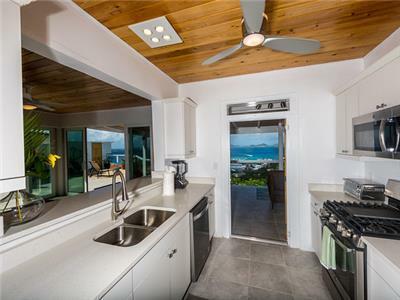 Wished that the living area had a curtain but other than than Island Abodes is fantastic! Will stay here again! My brother and his girlfriend stayed at the Penthouse for 3 nights. We wanted to surprise them for a getaway while they stayed with us in Coral Bay, so they didn’t have to wake up to our crying and screaming kids every morning. Brittany was so easy to deal with while making our reservation. They let them check in early and check out late, such a welcome surprise. The Penthouse was absolutely perfect. 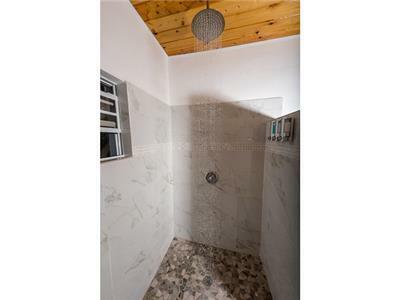 Sweet breezes, fragrant flowers, amazing master shower and everything top of the line. I wish we could have stayed there as well! My brother and his girlfriend had an amazing time and would definitely recommend to future friends and family... or maybe we’ll just have to go and try it for ourselves without the kids! This was our second trip to St. John, USVI in seven months... I didn't think it could get better than our last trip in July/Aug 2018, but this trip in March/April 2019 was incredible. A large part of that was due to our stay in the Island Abodes Penthouse Suit. I'll never forget walking through the suit doors and setting my eyes on the amazing view of Cruz Bay. The suit was perfect! 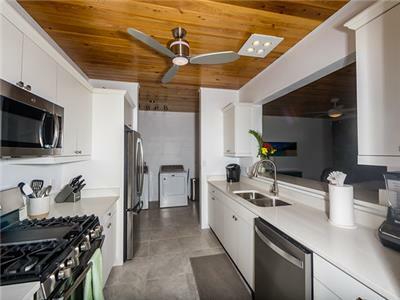 Island Abodes was very thorough and professional from start to finish. The whole trip was made easy through the detailed instructions provided by Brittany and Robert. They left no leaf unturned prior to and even after our trip had ended. We were very impressed and would definitely stay here again. Thank you Brittany & Robert for providing such a great place to stay while on island. We can't wait to return! 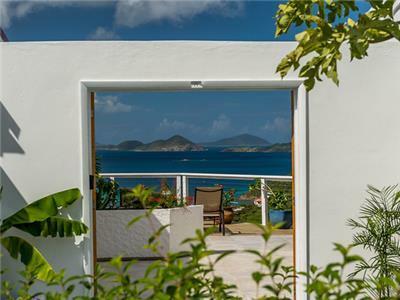 We greatly enjoyed our stay in the Penthouse of Island Abodes on St. John. The property is amazing with incredible views all times of the day and night. 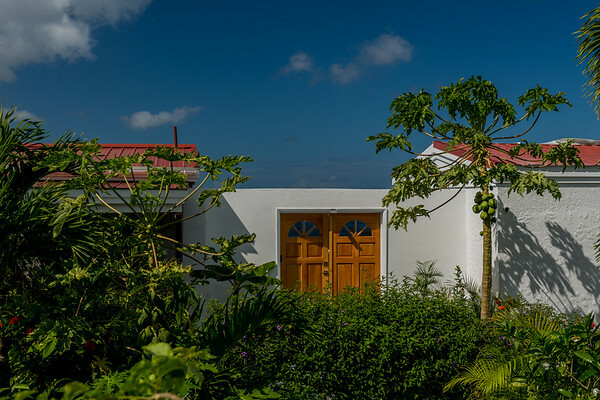 The accommodations are first class and Island Abodes has thought of everything you may need during your stay. 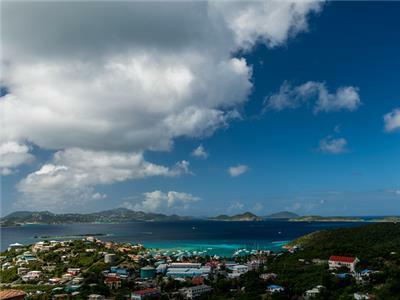 I highly suggest you select any of there properties when visiting St. John. It's the best vacation place in the world, seriously. Awesome place with very thoughtful amenities. We loved the Penthouse! We stayed 11 nights in beautiful St John and it was as fantastic as always. The Penthouse had everything you could ever need. It is rebuilt and beautifully decorated! Hats off to Island Abodes for providing such a wonderful place to stay in St John! I would recommend the Penthouse! The property was more than what the pictures posted showed it to be! Will most certainly stay again! The owners were amazing to work with and extremely helpful with overall island information for our honeymoon. The view almost didn't seem real it was so beautiful!! Great property and location. Island Abodes will be seeing us again and we are spreading the word of their great property to our family and friends. Thank you all so much!!! Thank you so much for your awesome review. We work hard to make sure our guests have great stays and it makes us so happy to know that you did! 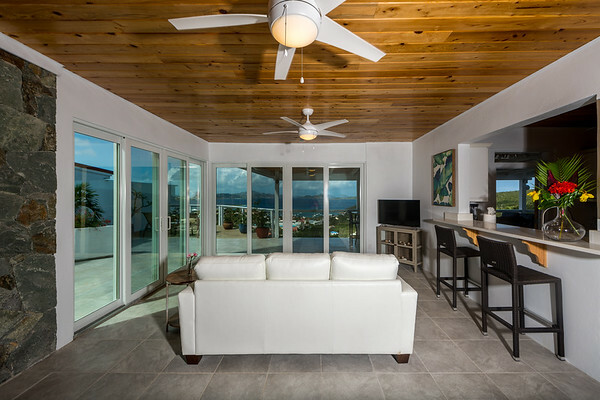 Our Penthouse Suite definitely has one of the best views overlooking Cruz Bay to St. Thomas. The sunset views are amazing! We so appreciate your willingness to spread the word about us to your friends and family. We would absolutely love to have you back as a repeat guest. Thank you again! We stayed at the Penthouse at Sunset Serenade the week of 6/3-6/10. This was our first experience renting a villa/condo that was not part of a complex or resort. From the first inquiry, until we left yesterday, the communications with Island Abodes were outstanding, including a multi-page document that spells out everything. I was immediately reassured and comfortable. Brittany and Paige both responded very quickly to any random questions I may have had about the property or St. John in general. When we arrived at the Penthouse after following the excellent instructions, we were thrilled. It looks exactly the same in person as in the pictures, which is to say, it is spacious, clean, and has an unbelievable panoramic view. The tiled covered porch (much too large to be called a balcony) that extends to the deck, is where we spent most of our waking hours at the villa. Looking over Cruz Bay and over to St Thomas and the other islands never gets old. So many things are provided, such as great beach chairs (Coleman in bags with shoulder straps, just like the chairs we used at soccer games, but sand chair level), a cooler, noodles, k-cups for the Keurig, toiletries, sunscreen, etc, that it made it easy to get established and going. Other thoughtful touches were a couple of local beers in the fridge and a welcome basket with snacks. The shower was wonderful, and you even had a view from there! AC in the bedroom was perfect, and having a washer and dryer available was very helpful. My husband loved it and said if just he and I returned, there is no where else he would want to stay. Even as we were on the ferry back to Red Hook, we could still spot 'our' penthouse high on the hill. If we return with our grown kids and need more space, we already looked at another Island Abodes property that has more room. Highly recommend! Trish, thank you so much for the incredible review and recommendation of your stay in the Penthouse Suite at Sunset Serenade! 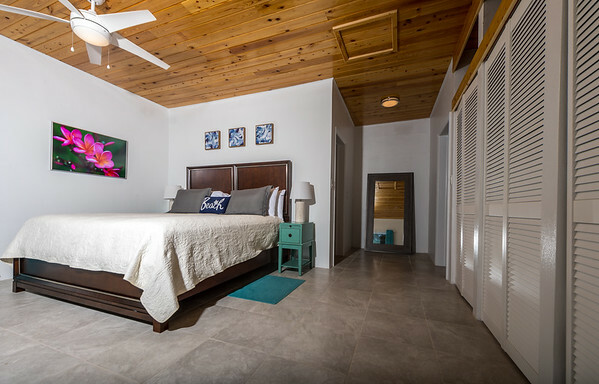 We are so happy to hear how much you loved the accommodations and that you enjoyed the personal touches, which made this suite your island home away from home. I'm glad your expectations from the website were met when you arrived at the Penthouse; it sounds as though the variety of provided amenities were appreciated and put to good use! 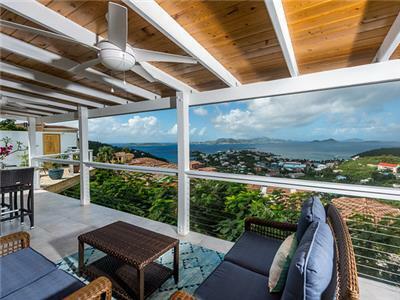 We never get tired of those stunning Caribbean views from the spacious private deck, either. We can't wait to welcome you back to Island Abodes for your next St. John vacation. 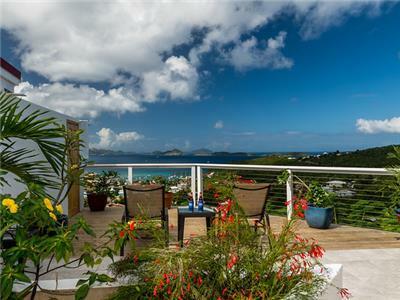 The Island Abodes Penthouse is an amazing property with amazing views of both St John and St Thomas. Both the live in area and the outdoor living space are well appointed, spacious and extremely comfortable. The owners, Robert and Brittany, made our visit even more comfortable by providing everything we needed for a relaxing stay. Beach chairs, cooler, towels, snacks, etc., made things even better. The unit was very clean and decorated with upscale furniture and amenities. Without a doubt, we will look no further for a place to stay when we return. Can't wait! Thank you so much for the incredible review of your stay in the Penthouse Suite at Sunset Serenade, Anne and Bob! 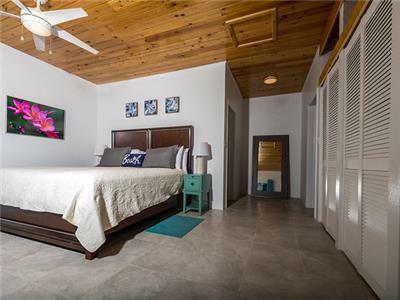 Robert and I are so happy to hear how much you enjoyed the accommodations, and it sounds as though you were able to make this suite your island home away from home. We know how important beach items are to a Caribbean vacation, so we make sure to provide all of the essentials! It's great knowing they were put to good use. As small business owners, our goal is to earn repeat guests, so we are completely thrilled to hear we'll be welcoming you back to Island Abodes in the future! Hurry back to beautiful St. John for another stay in paradise! Andonis, we're so glad you were able to experience the natural beauty of St. John while staying with us at Island Abodes! Come back soon! Great penthouse with awesome view, and even better hosts! My family and I stayed here during our first visit to St. John and we couldn't have been happier with the decision. Brittany and Robert were super nice and welcoming, and provided great recommendations for restaurants/beaches. This penthouse has top-notch amenities, including a fully stocked kitchen, washer/dryer, and TV with Netflix. 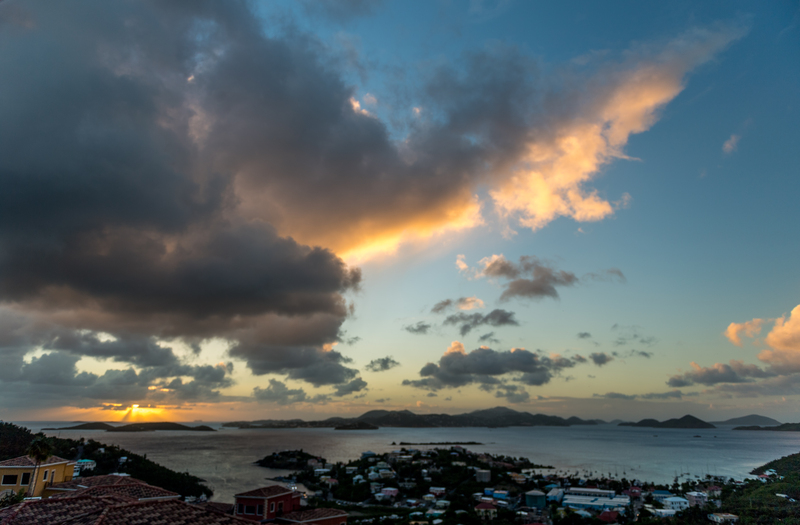 As others have mentioned, the view of Cruz Bay from the patio is amazing, especially during sunset. They also conveniently provide everything you need for a day at the beach (towels, mat, chairs, cooler, bug spray). I cannot recommend this unit and the Island Abodes team enough and will not hesitate to book with them in the future. Thanks for sharing your feedback on VRBO Albert! Robert and I appreciate you taking the time to post a review and include so many details about your recent stay in the Penthouse. We were so glad to hear you and your family had a good time and thank you for the recommendation! We look forward to welcoming you back in the future :) Take care! Thanks for your review and for choosing Island Abodes! I was happy to help with your reception and am just glad everything went so well. And Congratulations again! We appreciate you trusting us to host your special event and hope you'll keep us in mind for future visits. Thank you again! We'd definitely stay here again! I can't say enough good things about Brittany. As soon as I booked the place, she emailed with information about the ferry, jeep rentals, beaches, boat tours, etc. She answered all my questions and so quick to respond! The place was beautiful. Modern, clean and spacious! 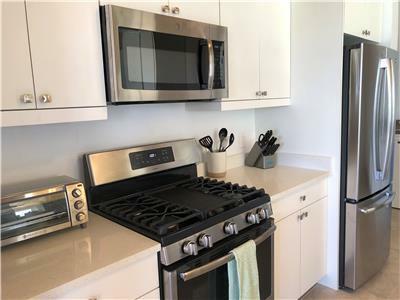 The full kitchen is well stocked with utensils and appliances. Beach chairs, noodles, an umbrella and a cooler were provided (huge convenience). The view was spectacular! The photos do not do this place justice. My boyfriend and I enjoyed having coffee outside on the balcony and watching all the iguanas bask in the sun. 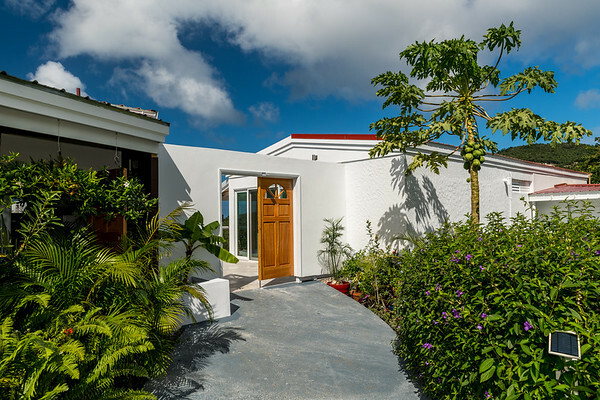 The location is great and located just a short 5 min drive to downtown Cruz Bay. A $5 taxi ride per person. We had such great time on the island and I'm so glad we found this place to call home during our trip! Would 100% recommend to friends and family! Alison, thank you so much for your review and recommendation!! I am always happy to answer questions and share the ins and outs of island life to make your vacation as seamless and relaxing as possible. I’m thrilled to hear that your stay in the Penthouse Suite at Sunset Serenade exceeded your expectations and that you found the suite to be clean, well-stocked, comfortable, and beautiful. It sounds as though you enjoyed taking in the stunning Caribbean views from the private deck – definitely one of the best features of the suite! I’m glad you felt the location was convenient and that you took advantage of the various beach amenities. 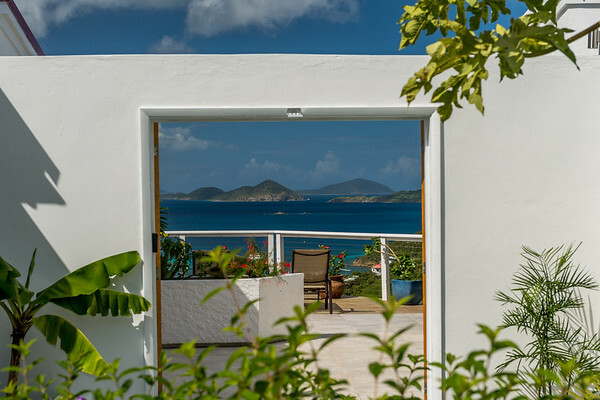 We hope to welcome you back to Island Abodes on your next visit to sunny St. John! We loved our stay at the Penthouse suit! We started off in the one bed room, also amazing! But because of availability we were able to go to the Penthouse and we loved it! The bathroom, kitchen, and bedroom were spacious and clean. We would come back in a heartbeat. Gaven, thank you for the review! I’m glad you were able to experience both the One Bedroom Suite and the Penthouse Suite at Sunset Serenade … it sounds as if you really enjoyed both! I’m happy to hear that you found the accommodations to be spacious and clean. We hope to welcome you back to St. John for another stay with Island Abodes soon! My fiance and I had an excellent stay in the Penthouse Suite. The pictures don't do it justice. The place is spacious and the views were breathtaking. The location is perfect - by taxi: 5 minutes to the grocery store, 5 minutes to the Westin (a nice spot to have lunch and a fruity cocktail) and 10 minutes or less into town for dinner. 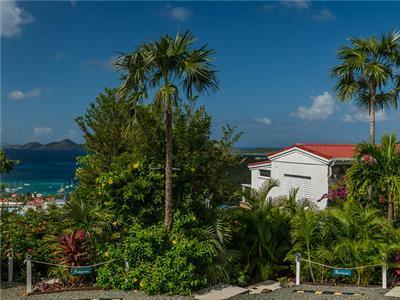 The property is high enough that it offered a spectacular view of the houses in the hillside, the sunset over the water, Cruz Bay and St. Thomas. I think we had a rainbow almost every morning too. The house was very comfortable and had everything we needed. The kitchen was very well stocked, there were plenty of nice quality/soft towels (beach and bath) and there were more hangers in the his and hers closets than most hotels provide, which I loved. The bed is very comfortable and the bedroom and bathroom were huge! The owners offered lots of guidance and recommendations about the island and our trip. We were thrilled to find the house stocked with items that we couldn't/didn't pack in our carry-ons (sunscreen and bug spray). They also had coffee and some snacks stocked in the kitchen which were much appreciated! We love to hike and really enjoyed the Ram's Head Trail & Reef Bay Trail. We did a private SUP yoga class in nearby Chocolate Hole, which was great. Our favorite restaurant was Extra Virgin. After daily excursions, we would make an effort to make it back to the Penthouse Suite in time to catch the sunset. I think you get the best views on the island from this property. Each morning we lingered over coffee and the breathtaking views on the comfortable porch furniture. I weighed staying at one of the hotels and am so happy that I picked this place for our vacation. Thank you so much for your kind words and review of the Penthouse Suite at Sunset Serenade! I’m so happy to hear that you and your fiancé enjoyed your stay immensely and found the suite to be conveniently located on island. 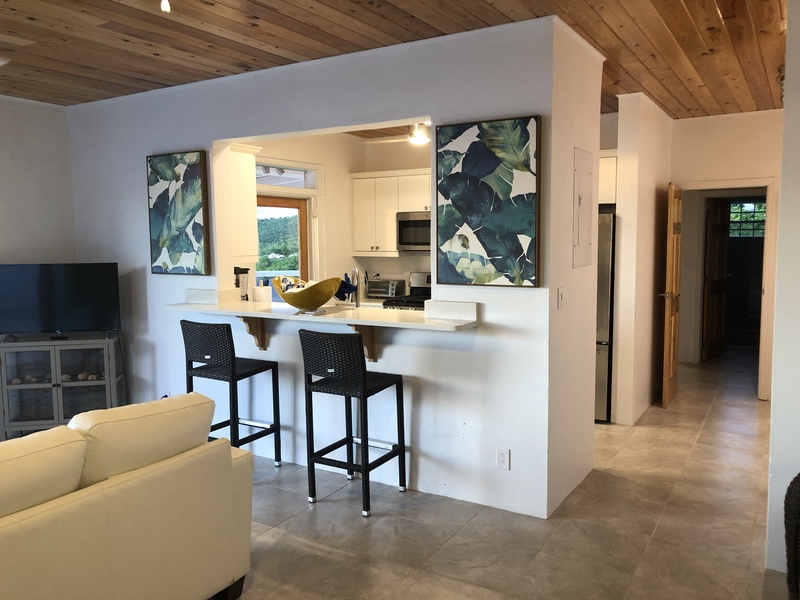 It sounds as though you found everything you needed in the suite and appreciated the provided amenities; Robert and I try to think of everything we like to have in our vacation accommodations and then we strive to provide those comforts at Island Abodes. 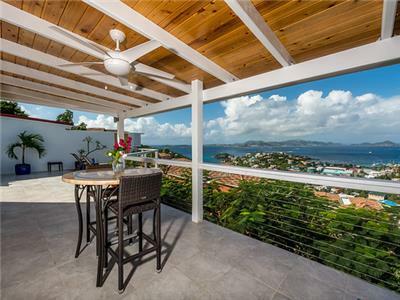 I love that you so enjoyed the gorgeous Caribbean views from the private deck and were able to relax on the cozy outdoor furniture while taking in the beautiful rainbows and sunsets. They’re good for the soul! I can tell that you two truly embraced island life and took advantage of the many amazing things to do on St. John. Come back to visit us in Love City again soon! What Great Vacation Stay and The View Was Amazing! First, I’d like to say thank you to Brittany! My wife and I decided to do something different for our 15th Anniversary, so this trip was our Anniversary and Christmas gift. As soon as I booked the Penthouse, Brittany emailed me with information about the ferry schedules and jeep rentals. This was a big help, prior to our arrival one of her emails informed us that two of the four ferries were in dry dock so the lines may be long. We needed to get to the ferry dock as soon as possible so we wouldn’t miss our ride. She was quick to respond to all emails! This place was just WOW! The Penthouse was very clean and spacious! The kitchen was fully stocked with utensils and appliances. The House also provided beach chairs, an umbrella and a cooler which was a huge convenience. The king size bed was very comfortable and the bedroom and bathroom were huge! The thing I enjoyed the most was the bedroom had an A/C unit in it and for me being able to sleep comfortable was a plus. The view from the patio and deck was spectacular! During our stay, we would start our morning outside on the patio admiring the rainbows after the light morning rains and watching the iguanas hanging out in the trees next to the house. 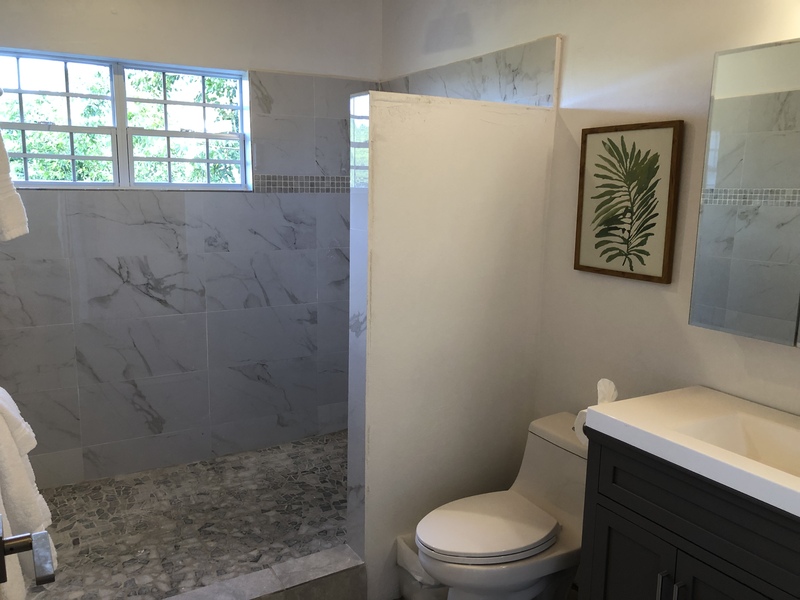 The location of the house is great, it just a short 5 minute drive to downtown Cruz Bay and less than 2 minutes from the grocery store. We had a great time on the island and I'm glad I found this place in St. John! I'd return back to this property for another stay! I would also recommend this place to friends and family! Sabino, thank you so much for the awesome review and recommendation of your stay in the Penthouse Suite at Sunset Serenade! We were so happy to help you celebrate your 15th anniversary, island style. I'm glad to hear you found the accommodations to be comfortable, and that you enjoyed the convenient location, air conditioned bedroom, and the variety of amenities. As small business owners, Robert and I strive to provide our guests with the best vacation experience possible! 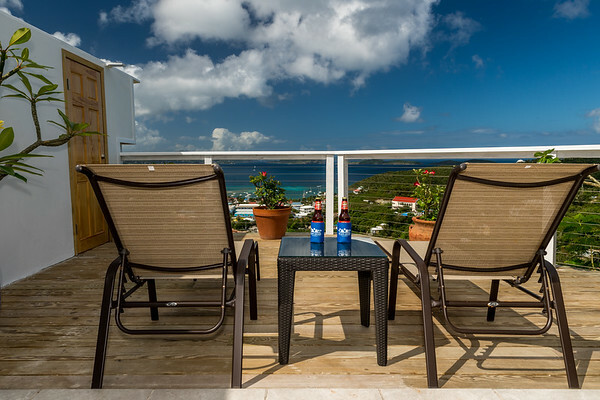 You really can't beat the stunning Caribbean views from the private deck ... I love hearing how much time you were able to spend outside relaxing. We hope to welcome you back to Island Abodes and Love City soon! We felt at home the minute we walked in the meticulously clean and well stocked penthouse. Everything was perfect. The view was exceptional and the sunsets were extraordinarily beautiful. Brittany and Robert are two of the most hospitable people I have ever met. They are on top of everything. From the minute you pull in the drive you know that it is going to be an awesome vacation. The landscaping and the grounds are beautiful. We have been going to St. John for over 12 years. This was our best stay ever. Everything you need is there for you to enjoy. Beach chairs, cooler, beach umbrella. Two of the most considerate people I have ever met. Many thanks for the awesome review, Steve! Robert and I are so happy to hear that you felt at home in the Penthouse Suite at Sunset Serenade. 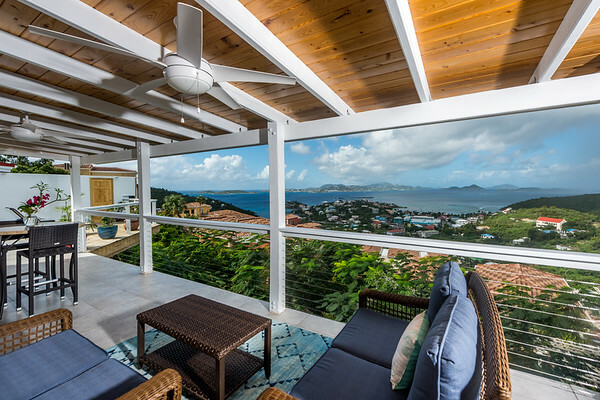 We love those stunning Caribbean views from the private deck, too! 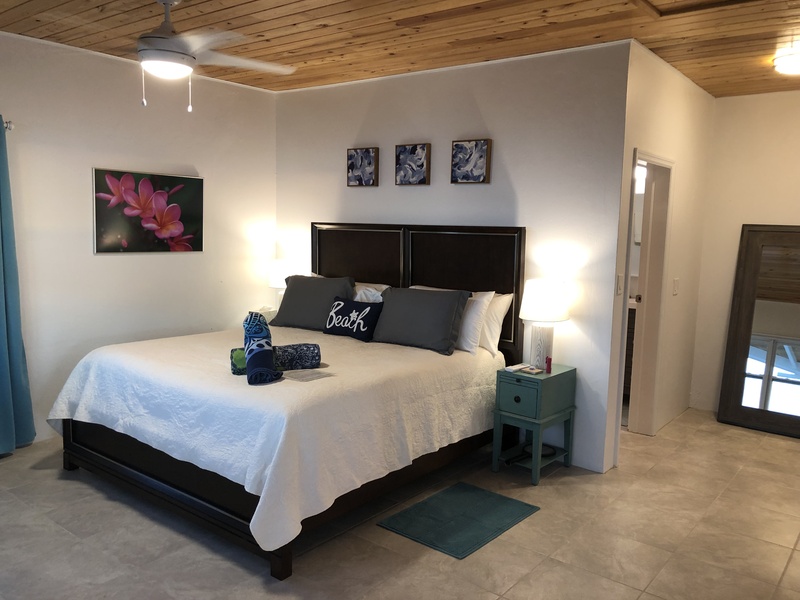 It is our pleasure as your hosts to ensure that the Island Abodes accommodations are well stocked with amenities, including essentials for a relaxing day at the beach. We’re glad to know you put them to good use! 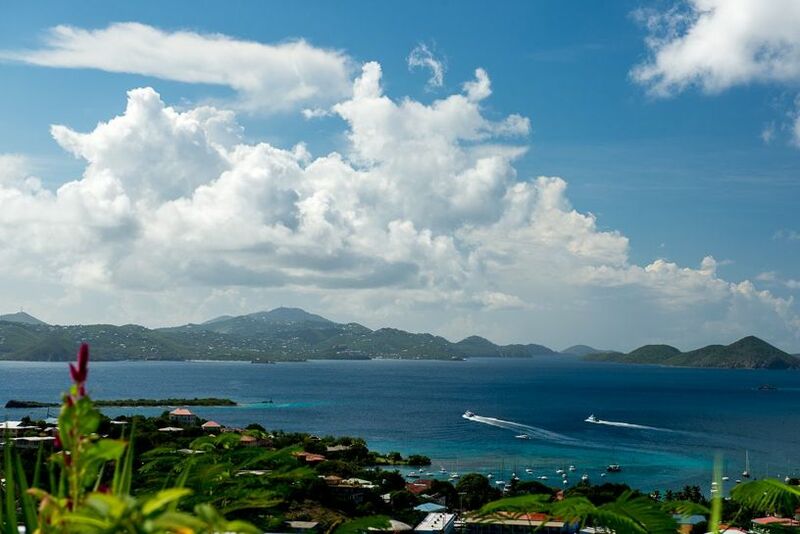 As frequent visitors to St. John, we are honored that you chose to stay with us at Island Abodes this year. Come back soon! 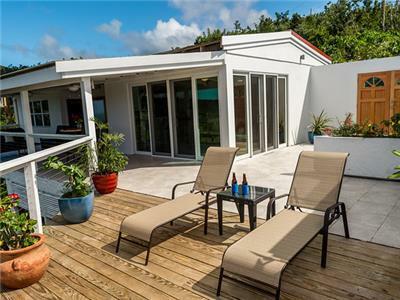 The Penthouse is a Great place to relax at , The Deck in the morning with your cup of coffee , to your cocktail in the evening , the views daily are great , even the iguanas in the trees close by pretty cool. The Penthouse has all the things you need , grab the cooler , beach chairs . head to the beach , the most beautiful beaches in the world . Stop at the Star Market on your way back , just down the hill , get some streaks , sea food to grill , grill is like brand new , because you wont want to leave once you return to the Penthouse . Take a Day to Coral Bay , have lunch at Miss Lucys , stop at Skinny legs get a refreshment Take a trip to Foxys and Soggy Dollar bar , a must do .in Jost Van Dyke The owners take great pride in there property , Very Clean , felt very safe Recommend a Jeep , we get in St Thomas , get our groceries there and car ferry over. It is every thing the pictures shown and then some. Thank you so much for the awesome review of your stay in the Penthouse Suite at Sunset Serenade, Craig! I’m so happy to hear you found the suite to be clean, safe, relaxing, and well stocked with amenities. You are right, Robert and I certainly do take great pride in keeping our properties in pristine condition. We’re glad you enjoyed the beautiful Caribbean views from the private deck while sipping on coffee and cocktails! It sounds as though you fully immersed yourself in island life and visited all of the hot spots on and around St. John! We hope to have you visit us at Island Abodes again soon. This was our 2nd stay of what we see as many more to come. Brittany and Robert are amazing and their properties are wonderful. From the first visit we felt like we were more than just guests and for that we are already planning our 3rd trip back this fall. The property has everything that you could possibly need or want, comfortable bed, furniture outside and a laid back vibe. Most days we'd get up early, sip some bubbles and head out to return early in the evening and watch the sunset from our deck, the only other soul we ran into during our stay was the iguana that hung out in the tree across our deck. Some days we went out others we just hung in and sipped some wine and relaxed. Make sure to get over to Skinny's for a pretty awesome burger, and The Landing has daily breakfast special and pretty good cocktails to start off the day ;) There is a grocery and wine store up the street that we stocked the cooler with daily for our treks to the many beautiful beaches, plenty of nearby restaurants if you feel like heading out as well. We would and do recommend Brittany and Robert if you're thinking of visiting St. John. Thank you for the review Dean! Robert and I really enjoyed reading it and we can't thank you enough for taking the time to share it. And thank you for choosing Island Abodes AGAIN! You basically have the island lifestyle down based on your description of your days, and we're just glad we can be your hosts and be sure to ensure you have a great time! Thanks for the details in your review regarding the property and the amenities nearby. We really look forward to welcoming you back in the fall. Thank you again and we'll see you soon! We absolutely loved the Penthouse! My husband and I just spent 9 nights here and can't wait to return. Brittany and Robert were awesome and their attention to detail was very much appreciated. The property is gorgeous and the the view is breathtaking! We thoroughly enjoyed our stay!! Kathy, thank you so much for taking the time to review your stay in the Penthouse Suite at Sunset Serenade! Robert and I were so happy to host you and your husband during your Caribbean getaway. I’m thrilled to hear how much you enjoyed the accommodations and the property – that gorgeous island view from the private deck sure can’t be beat! 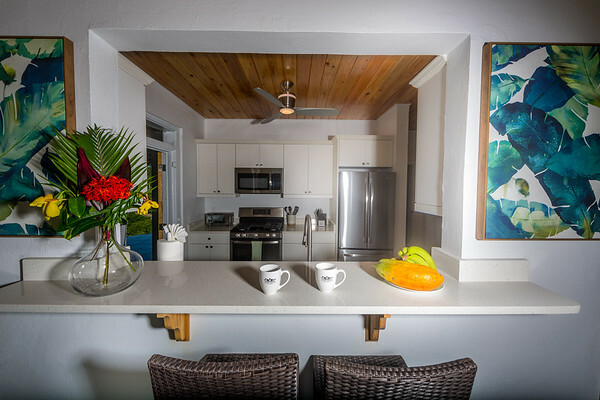 We hope to welcome you back to Island Abodes during your next St. John vacation. Thank you for the review of your stay in the Penthouse Suite at Sunset Serenade, Presslie & Julie! We always love to hear how much our guests enjoy their St. John vacations and Island Abodes accommodations. I'm glad you found the suite to be well stocked with amenities and that you enjoyed beautiful Caribbean views from the private deck! Robert and I hope to welcome you back to this little piece of paradise next year. My husband and I stayed in the Penthouse Suite and were very pleased with all aspects of the stay. The manager greeted us upon arrival and gave us a quick tour which was very nice of her to do. The space is very large, modern, bright and clean. Exceptional comfort on all levels. There was a very spacious, private deck with an excellent view as well. Our stay was for three nights and we are looking forward to the opportunity to stay there for our entire vacation next year! Jane, thank you for the review of your stay in the Penthouse Suite at Sunset Serenade! I’m happy to hear you found the accommodations clean, comfortable, bright, and contemporary, while enjoying the spacious and private outdoor deck. The beautiful Caribbean view is certainly one to remember! Robert and I look forward to welcoming you back to Island Abodes for your next Love City vacation. My boyfriend and I recently returned from a week-long stay at Brittney & Robert’s Penthouse Suite at Sunset Serenade. I would unequivocally agree with all other reviews: This is truly an amazing property. All pictures you will see of this suite are 100% accurate. Upon arriving on St. John, we picked up our rental car and headed off to meet Brittney directly at the suite. As we walked through the gate to the Penthouse Suite, we immediately knew we made the right decision in picking this property to spend our vacation. As the amenities state, the suite has everything you need for days at the beach: chairs, towels, umbrella, a cooler & ice packs, and even a noodle! The Ear plugs in the bedroom were a nice touch, not needed due to any of the neighbors or bar noises, which were non-existent. They came in handy for the early morning rooster wake-up calls! We neither heard nor saw any of the suite’s neighbors; that's how quiet the suite is. It is worth the money to rent a Jeep. Trips to Coral Bay, breath-taking drives on Bordeaux Mountain Road, and excursions to the lesser-known beaches are not to be missed. We didn’t want to eat out every meal. The suite’s stocked kitchen allowed us to cook breakfast every morning and dinner on all but two of our nights, when we splurged and dined out (with recommendations provided by Brittney). We cooked dinners on the grille and ate outside watching the sunset. My only disappointment was that I didn’t see the 20% off coupon for Starfish Market Brittney provides before we stocked up for the week! Starfish Market is very close by for all your grocery needs, Even closer is the gas station recommended the by car rental company, with a coin-operated vacuum (sand removal!). We didn’t need to speak directly with Brittney or Robert during our trip, because they really do accommodate for every need during your stay. However the few times I did text, Brittney’s responses were immediate and thoroughly answered. Stay at the Penthouse Suite at Sunset Serenade. You won’t break the bank, you’ll have an amazing vacation, and you will want to return! The place was just as advertised. It was clean and well kept. The outdoor deck provided us with all we needed to enjoy the beautiful scenery. The location was very close to the downtown area and the Star Fish Market was just a few blocks away. It's nice when your traveling in an unfamiliar area and everything is so convenient. The owners were very responsive and always answered our questions immediately. I'd return back to this property for another stay. So happy you enjoyed your stay in the Penthouse Suite at Sunset Serenade, Mike! Thank you for taking the time to write a review of your visit. I’m glad to hear that the private outdoor deck provided you with a relaxing, tropical environment and that you found the suite to be conveniently located and clean. We are always happy to answer any questions our guests may have! Please come back to stay with Island Abodes again! My husband and I are frequent visitors to the islands, however this was our first experience renting from Brittany and Robert. We couldn't have been happier with our decision. The location is great, just a few short minutes from all important things, but far enough that you have the privacy you need. You can tell that they have put a lot of time and effort into this place. The attention to detail is unparalleled. Luxury at an affordable price, you can't go wrong. The only thing I would say could make it more perfect, is a hot tub and that beautiful and expansive deck. We spent so much time out there watching the boats, sunsets, and stars. Quite a nice break from it all. Will be back, soon! Melissa, thank you so much for the lovely review of your stay in the Penthouse Suite at Sunset Serenade! As frequent visitors to St. John, Robert and I so appreciate you taking a chance and choosing to stay with Island Abodes. We're so happy to have provided you with a luxurious island retreat! I'm glad to hear you found the accommodations to be conveniently located and private ... the best of both worlds. 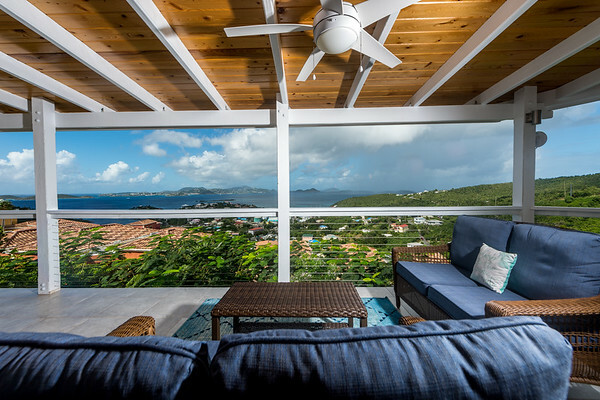 The beautiful Caribbean views from the private deck is one of our favorite features, too. We can't wait to welcome you back to Love City soon! My wife and I spent 8 nights (27 Oct - 4 Nov) in the Penthouse Suite to celebrate our anniversary. The view from the deck was incredible. Most days we would grab a couple of sandwiches or a meal from the North Shore Deli or Sam & Jacks Deli and watch the sunset while we ate dinner. The penthouse was clean and had everything we needed including coffee, creamer, sugar, condiments, and washing machine pods. It's great that we don't have to spend money on those supplies. Brittany even provided a nice gift basket of snacks and some needed beverages in the fridge upon our arrival. Since we arrived after 7, it was a challenge to find the site in the dark, but I think we only made two wrong turns before we found the unit. My wife couldn't stop raving about the shower and how great if was to have an outdoor "feel". We discovered that November seems to be a rainy month, however, we were able to wait out most of the storms and it really didn't impact our daily schedule much. Just want to say thanks to Brittany for answering all of our questions and even making two trips out to the Penthouse when we were in need of some supplies. We may be returning in the Spring and will definitely look into one of the Island Abodes properties. Scott, thank you so much for taking the time to leave a review of your stay in the Penthouse Suite at Sunset Serenade and for choosing Island Abodes for your anniversary celebration! I am ecstatic to hear that you and your wife thoroughly enjoyed the suite and its amenities. Robert and I strive to make our accommodations as welcoming and convenient as possible for our guests. The view from the private deck is absolutely one of the best features of this suite and I love that you were able to dine al fresco most nights during your stay. And there is nothing better than the feel of an outdoor shower when you’re on a tropical island, so I’m happy to hear that this was a highlight of the suite for your wife! 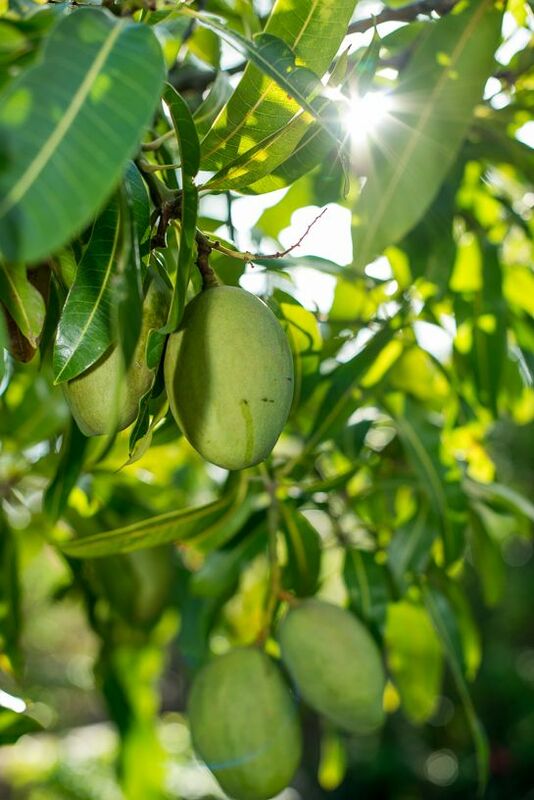 As your Island Abodes host, I am always ready and willing to answer any questions and restock supplies to ensure you experience the most relaxing vacation possible.. We hope to welcome you back to St. John this spring! My husband and I spent a little over a week at the Penthouse suite for our honeymoon and couldn't have been happier with the property or the way it was managed. It looks just like the pictures, has an amazing view of Cruz Bay and all the basics for your stay, plus some upgraded items to make you feel at home. I don't recommend this location if you plan on walking to town/closer beaches every day because it is up a very steep hill, but perfect if you rent a jeep which is what we did. The more private location was exactly what we wanted and spent most evenings on the huge balcony enjoying the view. Brittany was great, picked us up from the ferry, took us to the grocery store when we arrived and reccomened bars/restaurants along the way. She was an amazing host. I can't imagine staying anywhere else on the island if we visit St John again. Ashlyn, thank you so much for taking the time to write a review of your honeymoon stay in the Penthouse Suite at Sunset Serenade. We are thrilled that you and your husband chose to celebrate such a special occasion with Island Abodes! 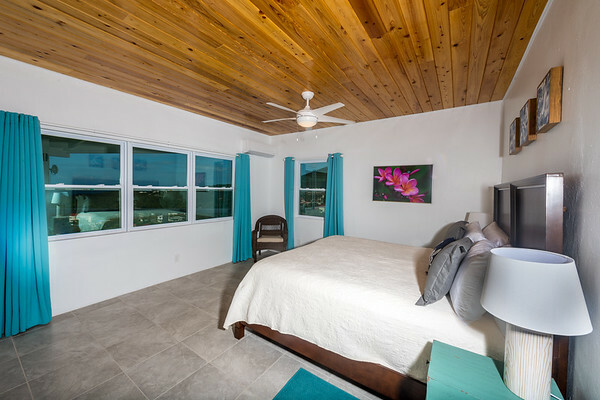 It sounds as if you especially loved the gorgeous Caribbean views from the spacious deck, the private feel of the suite, and the various amenities offered. Robert and I strive to stock our accommodations with as many conveniences as possible for our guests so that you can focus solely on rest and relaxation. I’m so happy that you were able to experience and enjoy this stunning piece of paradise as newlyweds. We hope to welcome you back to Love City for another stay with Island Abodes in the future! This was my husband and I's second trip to St John and we could not have picked a better place to rent. 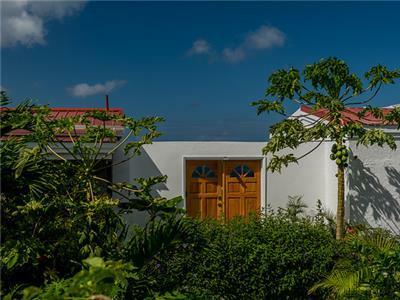 The property is so convenient to Cruz Bay, yet far enough out for a peaceful setting. The views are GORGEOUS! The penthouse was very well equipped and we had everything we needed. It was very clean and everything was well maintained. Wishing we were back there already, 6 days was not enough! Jessica, thank you so much for the review and for choosing the Penthouse Suite at Sunset Serenade as your vacation home away from home! I am so happy to hear that you found the location both convenient and peaceful. 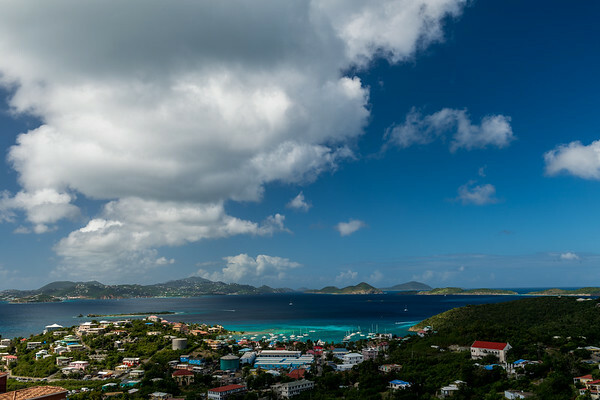 It sounds as if you enjoyed the breathtaking views from the three outdoor decks and truly took the time to experience the tranquility of St. John. Robert and I are thrilled to hear that the Penthouse Suite provided you with clean and well-stocked accommodations; we plan ahead so that you don’t have to! Island Abodes hopes to welcome you and your husband back soon for a third trip to Love City. Everything clean and in order. Easy to communicate with. While there are other units on the property you wouldn't really have any indication if anyone else was there. Nice view overlooking Cruz Bay, but also very convenient to get down into town. Would definitely recommend / stay there again. Use the binoculars! Thank you for your review and for posting it on Airbnb Johnny! We really appreciate your feedback regarding your recent stay with us at Island Abodes. 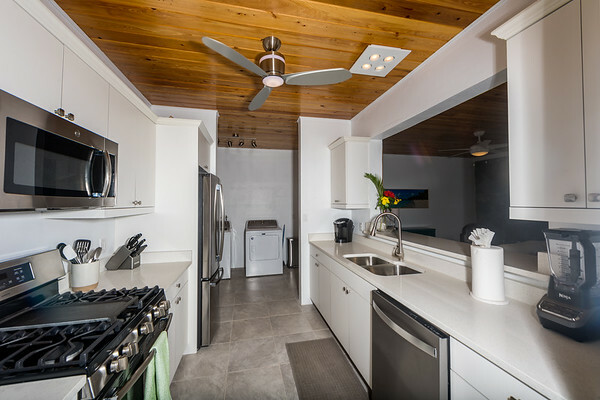 It sounds as though you enjoyed the Penthouse and the view overlooking Cruz Bay, and we're glad you found it to be clean and comfortable. We're also glad you used the binoculars and thank you for encouraging other guests to do the same. We live on such a beautiful little island and we're so glad you were able to enjoy it during your stay with us. Thank you again and we hope to welcome you back in the future! 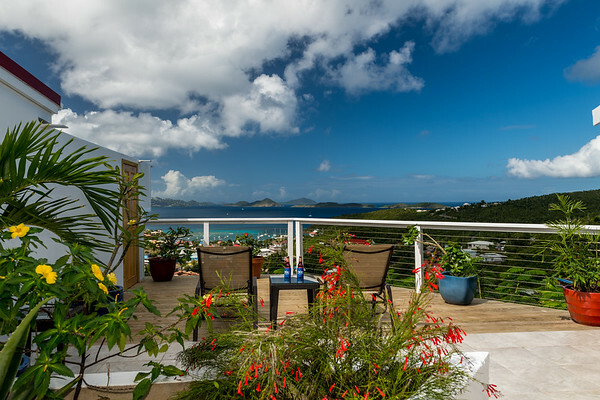 My husband and I just had the most wonderful week enjoying the hospitality of Brittany and Robert at their Penthouse at Sunset Serenade home rental on St John. It had everything one would need both to stay at the house and go off to the fabulous beaches for the day. We made use of the cooler, beach mat, beach chairs and beach towels every day. Returning back to a clean comfortable place with a hot shower, HUGE private deck overlooking the bay, and finally a comfortable bed completed the day. We spent most of our time on the deck, the unit starts behind a wooden gate and everything behind it is completely private to the Penthouse guests. This might just be the best place to watch the sunset on island. The whole living room slides open with massive sliding doors with screens! Leave the glass open and the screens closed and you get a super cool ocean breeze. We had no idea other guests were on property, they have done an excellent job of making each unit super private from the other. The kitchen was well equipped and I loved how the place had a washer, dryer and dishwasher! The bathroom, well let me just say, it was AWESOME. Felt like you were outside! The space is so large, that my husband could be in the living room enjoying the Roku TV (and they provide tons of free channels) and I had peace and quite in the bedroom or on the awesome deck. We rented a vehicle and always do when we visit St. John. Regardless of where we stay, a vehicle is a must to make the most of your St. John vacation! All and all, hands down the nicest place we have ever stayed. 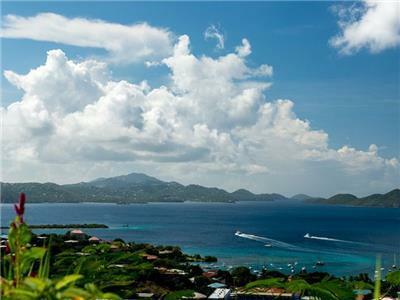 We love St. John more then Hawaii and highly recommend Island Abodes! Thank you for your glowing review Duncan! Robert and I truly appreciate your feedback and really enjoyed having you both as our guests. 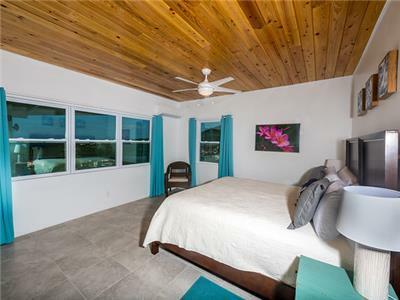 We do our best to stock all of our Island Abode properties with anything and everything you may need and we're just glad we were able to help you have a relaxing vacation. Thank you for choosing to stay at the Penthouse, for including so many details regarding the accommodations, and for saying it is the nicest place you've ever stayed. That means so much to us and we hope to see you again very soon! Take care! Huge deck, with lots beautiful outdoor furniture. We hosted a sunset ice breaker / reception for about 30 wedding party friends that was a huge success. Brittany arranged all the taxi transportation and catering for our guests that worked out perfectly. Inside the villa is very roomy with a huge living area that has a bar looking into a full kitchen. Love the bathroom and the bedroom was perfect. Slept great every night and the air conditioning was fantastic. The villa and the view was so good, that I hated to leave to go anywhere else. First of all, Brittany and Robert are absolutely amazing! They were exceptionally accommodating, and thought of everything you will ever need! 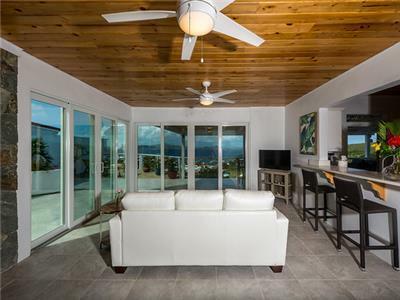 The penthouse was perfectly furnished and has an incredible view of Cruz Bay! I will definitely be booking another trip to St. John soon!! Thank you Georgia! Robert and I appreciate your review and feedback and were just so glad to hear you enjoyed your stay with us. It sounds as though you enjoyed the Penthouse, the breathtaking views and provided amenities. We look forward to your next trip to St. John and hope you'll chose to stay with us at Island Abodes once again. We'd love the opportunity to provide you with another great stay. Thanks again! We loved staying at the Penthouse at Sunset Serenade! The property is beautiful, and the views are amazing! Brittany was helpful and available to answer any questions we had throughout our trip. Our experience with Island Abodes was easy and stress-free. We enjoyed sitting on the porch each morning drinking coffee and enjoying the amazing views. We can't wait to come back to St. John and we plan on staying with Island Abodes again! Would definitely recommend to anyone looking for a peaceful and romantic place for their tropical vacation! Thank you so much for your review and recommendation. It was my pleasure to assist you and ensure you guys had a wonderful stay, and it sounds like you did just that! Robert and I were happy to hear you enjoyed your mornings on the porch and the spectacular views. We hope you'll keep us in mind next time you visit St. John. We'd love to welcome you back and provide you with another great stay. Thanks again Emir! My wife and I stayed here recently for our 10 year anniversary and have nothing but great things to say about our experience with Brittany and Island Abodes. She was awesome to deal with from the start to the finish, and did a great job of providing a lot of very helpful and much needed information to help you arrive on the island and get in comfortably with no problems. She was also always readily available if we had any questions, needed local knowledge, etc. The penthouse at island abodes was amazing... The view of Cruz Bay is breathtaking in the morning for coffee and breakfast on the deck, but it really shines in the evening as the sun is setting. WOW! We witnessed some of the most jaw dropping sunsets I have ever seen. Words can't describe how beautiful it is. 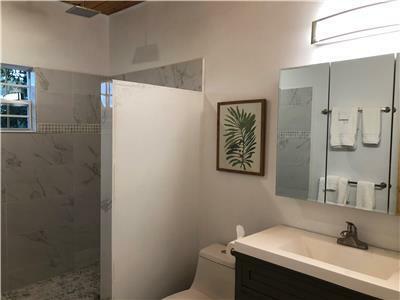 The name "Sunset Serenade" is very fitting for this property. The accommodations were awesome as well. The A/C in bedroom was nice and worked well. The linens and the bed itself were very nice and clean and comfortable. 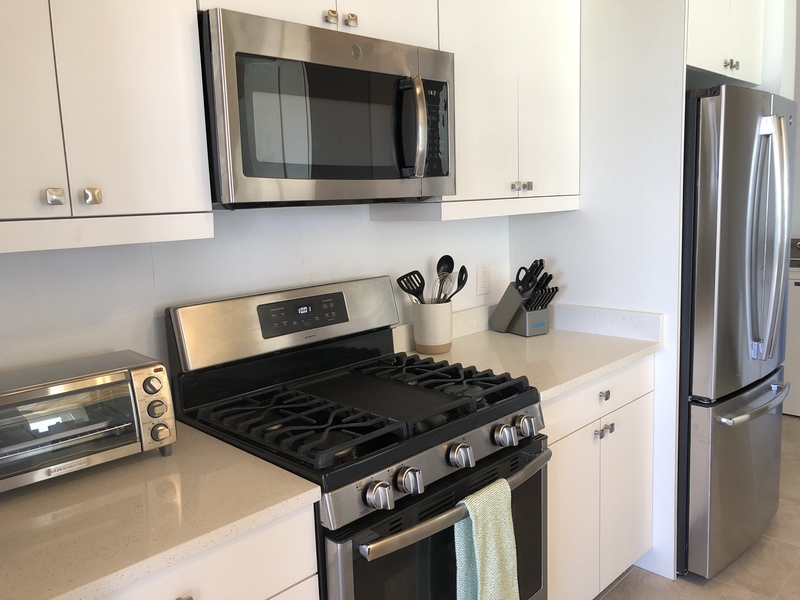 All appliances were new and clean and nice. All the little things were thought of and taken care of, which makes it very inviting to just come in and relax. The deck is HUGE and makes the penthouse feel like it is twice as big as it really is. We spent most of our time out there admiring and appreciating the view when we were actually on the property and not exploring the island. Brittany... Thanks again for sharing your slice of paradise with us and we can't wait to come back! Thank you Trent and Happy Anniversary once again! We were honored to be chosen for your special anniversary stay, so thank you so much for choosing Island Abodes and the Penthouse Suite. Robert and I can't thank you enough for your kind words regarding Customer Service and the property and island itself. Your review made us smile and we hope to welcome you and your wife back year after year. We think an annual Anniversary trip is a great idea! Thanks again and we'll see you soon! If you are like me and like to feel at home even when you are not, this is definitely the place to be. Sunset Serenade's name does not do it justice. The views from the building are spectacular! The layout of the penthouse is well put together, featuring a common area, kitchen, dining area, workout equipment, laundry, large master bedroom and bathroom. 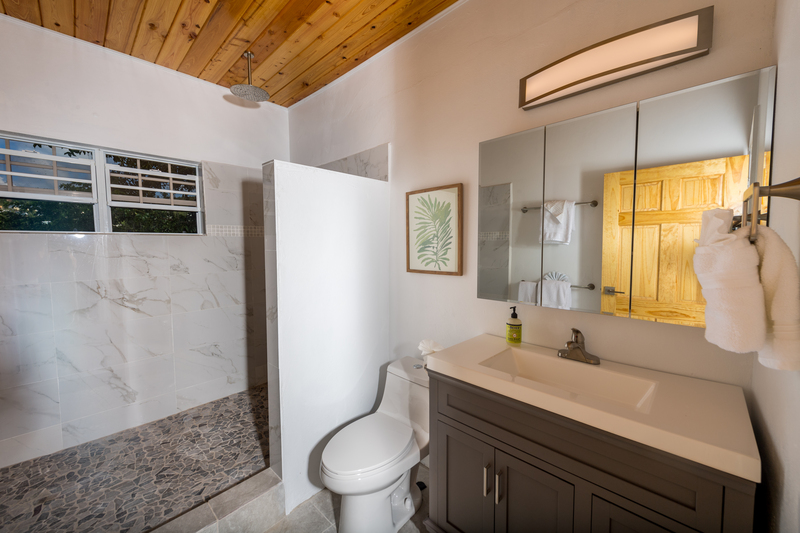 The suite also comes with great services including wifi, air conditioning, a working kitchen, washer and dryer, and a wrap around porch to watch the sun set over the water. Sunset Serenade includes a penthouse, one bedroom suite, honeymoon suite, and a studio apartment. Each suite is in a prime location only a few minutes away from town! I plan to return to St. John many times and I cannot see myself staying anywhere else! Many thanks Brock! We appreciate you choosing Island Abodes and for taking the time to share your feedback regarding your recent stay. We also appreciate the details in your review and for mentioning our other properties for future guests. It means so much to us that you felt at home at the Penthouse, and we hope you'll come back to visit us again real soon! Thank you again! I cannot say enough good things about the Penthouse at Sunset Serenade! The patio/deck area is so impressive! It's massive and there is plenty of comfortable seating including a day bed, couch, comfy chairs, and a table and chairs for dining. We definitely enjoyed the Roku player on the tv. Getting to watch live tv as well as Netflix was awesome! We loved all of the little touches such as board games and the exercise equipment. It made the Penthouse feel so homey! I also loved having shampoo and shower gel provided in the bathroom. The shower is amazing. 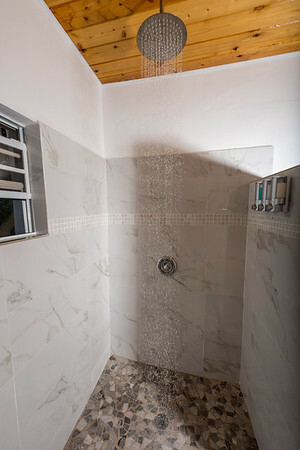 It has an awesome view and the rock and tile floor makes it feel like you're showering outside. We loved the kitchen as well. It was open to the living room area so I could prepare a meal while still interacting with my family. I would recommend staying with Island Abodes to all my friends and family! Thank you Shelby! Based on your awesome review, it sounds as though you enjoyed your time in the Penthouse Suite and that the patio, among other things, exceeded your expectations! Robert and I were glad to hear that you found the Penthouse homey and well equipped with anything you could need or want! We do our best to ensure our guests can relax and enjoy their stay, while we take care of the rest. Thanks again for posting your review on VRBO and for recommending Island Abodes to your friends and family. We'd love to opportunity to welcome you back, and we hope to see you again in the future! Thank you Theresa and JB! 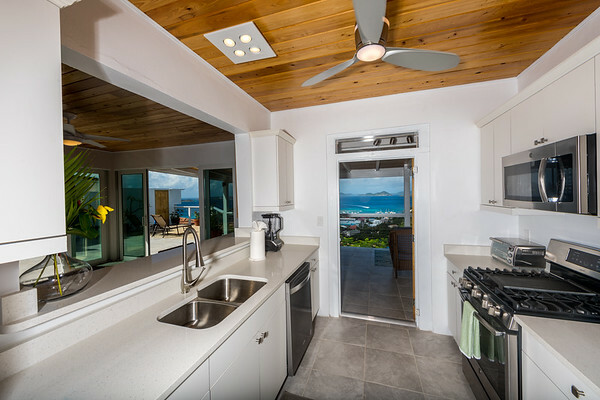 We know you have a choice when choosing where to stay on St. John, so we're honored you chose Island Abodes. It means so much to us that you enjoyed your stay with us, especially since you're an annual visitor and know your way around our beautiful little island! Thank you for the details regarding the Penthouse and your stay. We too hope to see you next year - please keep us posted. We'd love to provide you and your friends with another great stay to exceed your expectations! My family stayed in the Penthouse during our 4-night vacation to St John. Even before our arrival, Brittany and Robert were awesome hosts by answering emails quickly and helping with details about logistics of the trip. The Penthouse was a perfect home for us as it was very spacious and had the amenities we needed. I could have stayed on the patio all day - from the beautiful sunrise to the twinkling lights of St Thomas in the evening! The location was convenient to town, water sport activities and the market. We loved going to the beaches during the day, grabbing supper, then hanging out on the patio in the evening. Would highly recommend the Penthouse and Brittany and Robert!! We hope to return one day! Many thanks for your feedback Penny! Robert and I enjoyed having your family stay with us at the Penthouse and we can't thank you for enough for providing so many details regarding your recent stay. 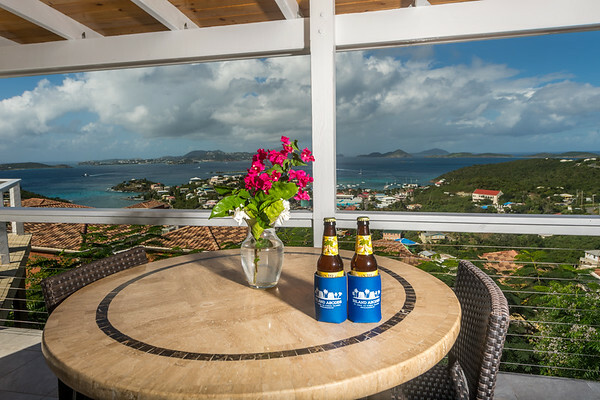 It sounds as though you enjoyed the Penthouse just the way we recommend, as a home base to enjoy the beautiful sights of St. John! Thank you again and please come back to see us very soon! Excellent views, convenient location and comfortable stay in a neat penthouse. We stayed with our 2 year old in this beautiful penthouse for 2 days and it was a great decision. The house was fully furnished with all the needed things, we also cooked a meal or two there and enjoyed the beautiful views. The owners were available to answers all our questions and are pleasant people. 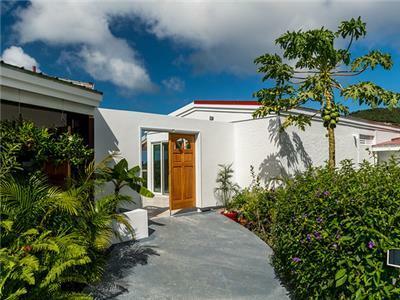 The location is great as it is close to the Cruz bay with restaurants etc. at an accessible distance. Highly recommend it. Thanks so much for your review and for taking the time to post your feedback on VRBO! We enjoyed having you and your precious family stay with us and were happy to hear you had a good time during your time with us. Thanks again and we hope to welcome you back soon! My boyfriend and I just returned from a week at the Penthouse at Sunset Serenade and it far exceeded our expectations. It was our first time on the island, and Brittany offered us some great recommendations. She also left us a stockpile of maps, guides, and some extra bug spray and sunscreen flashlights, umbrella etc., on top of supplying plenty of towels, beach towels, a cooler, lawn chair and other vacation essentials. She does a great job managing the property, and you can tell how much she cared about our experience. Air-conditioning in the bedroom was great- it cooled the room down quickly after we’d been out all day, and we never got hot at night. The bedroom was also equipped with a giant king bed, tons of closet space, and a bathroom with a fantastic shower view. The location was prime—located right above Cruz bay where all the restaurants and bars are, with a view of St Thomas and other islands across the way. We rented a Jeep for the week, which I would highly recommend for accessing beaches, but we were also able to walk downtown for happy hour/going out and easily take a taxi back up. (Walking back up is not for the faint of heart- very steep!). We also loved the location because it was up in the hills in a very tranquil setting—tons of lush green and plants, beautifully landscaped, and lots of soothing nature sounds that we don’t get to hear in the city. Felt like a true getaway. The best part about this place is the massive deck—the pictures don’t do it justice. Though there are other units, the penthouse deck felt very private (could not see or hear other tenants). Sunsets were unbelievable, and out of all the restaurant-with-a-view recommendations we were given from friends, it turns out we had the best one at our AirBnB! It was a nice change of pace to be able to use the outdoor grill (close by the front entrance) and make use of the deck for dinner—there was a grocery store a short drive away, and the kitchen was fully equipped too. Only ‘issue’ we had was when we left a little food in the sink after cooking—small ants will find it (as to be expected in that climate). Once we more conscious of cleaning up, we had no problems. Overall, we had a fantastic experience at Brittany’s place, and will plan our next St. John trip around when the Penthouse is available! We can't wait to go back. Thank you Bri! Your review is so sweet and Robert and I truly appreciate you taking the time to include so many kind words about your recent stay with us and the Penthouse Suite! We really enjoyed having you and Tommy.. you guys were great guests and left the place clean and tidy. We're so sorry about the ants, but it sounds like everything was rectified and yes, just as you mentioned, we do experience an increase in insects on island. I was happy to hear you had everything you needed and that you could tell how much I care about our guest's happiness. Thank you again Bri (and Tommy!) We'll see y'all soon and promise to exceed your expectations once again! Everything was amazing. Directions to get to the home. Getting in the home. There was even fresh water left in the fridge. I would definitely recommend this to others. The view was breathtaking and incredible and the penthouse is so amazing! We got lucky that they upgraded us for free! It was a very nice stay! Thanks for your review Jingqi! It sounds as though you enjoyed your time with us in the Penthouse Suite and we appreciate you posting your experience on VRBO. Thanks again for choosing Island Abodes and for your kind words regarding the accommodations and view, we'd be happy to welcome you back in the future! As soon as we arrived I logged in to the wifi to let Brittany know we arrived and before I got a chance to look at my email Brittany quickly arrived welcoming us. The penthouse is gorgeous. It was very clean and comfortable. 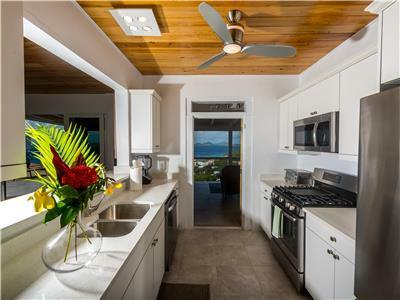 Situated overlooking cruz bay. The sunset was amazing. We had everything we needed. And it was a pleasure to meet Brittany and Robert! It was a pleasure to meet you Dolores! You were great guests and Robert and I really enjoying having you. Thank you for your kind words regarding your accommodations being clean and comfortable. We're so glad you enjoyed the sunset views and that you had everything you needed during your stay! Thanks again for sharing your feedback and we hope to welcome you back next time you're on St. John! Take care! My husband and I stayed at the penthouse for 4 nights and our entire stay was perfect! It has tons of space throughout... Huge bedroom, with great closet space, huge bathroom, great living room space with floor to ceiling glass doors that you can see the amazing view through. The kitchen is lovely with all the necessities you need in case you were to stay-in one night during your stay. The best part of the penthouse is the outdoor deck. 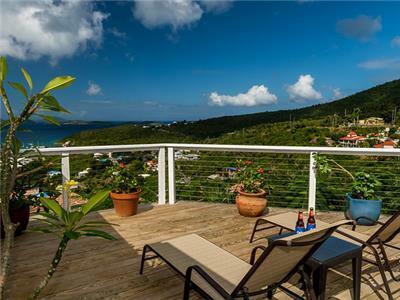 It has the best view of Cruz Bay and St. Thomas with other surrounding villas in sight. There is a hightop table with chairs and other seating where you can sit with a glass of wine and watch the sunset. It really is a perfect sunset viewing spot. We had plenty of towels and bathroom necessities. It was a treat to to have coffee from the Keurig each morning too! The penthouse even has a smart TV with a Roku in case you have a rainy day and need to catch up on your Netflix shows. 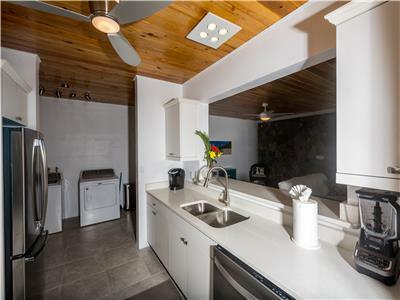 You probably won't want to watch TV while on island but it's a great amenity to have! Brittany and Robert are wonderful hosts. They are quick to respond and were really great about helping us figure out our way around the island. We really enjoyed our stay and will definitely be back. I won't hesitate to recommend the penthouse to all my friends and family. Everyone needs to visit St. John! And why not stay here?! Thank you for taking the time to share your feedback and post a review on vrbo Paige! Robert and I really enjoyed having you and your husband and we loved reading that you enjoyed so many of the amenities at the Penthouse and had such a good time. The sunsets are my favorite part of the house too. We really appreciate you recommending us to your friends and family - we'd be happy to have them anytime and ensure they have the best time on this beautiful island! Thanks again, we hope to see you soon. Best vacation ever!! Amazing views!! Can't wait to return!! My husband and I stayed in the penthouse unit at Sunset Serenade from November 11th until the 16th. The place was absolutely amazing. We traveled to St. John with another couple. They stayed next door in the Honeymoon Suite. It was great having our friends right next to us but still having our own space and privacy. It was also great being there with friends because we got to check out another unit. 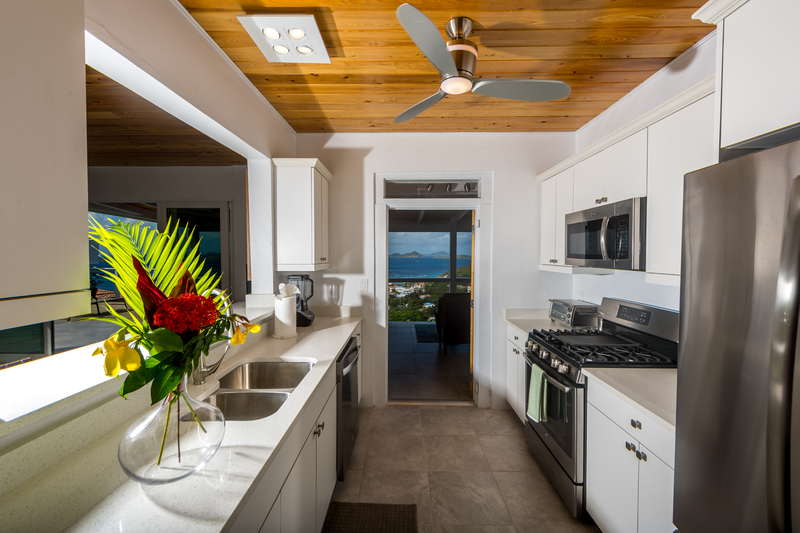 The inside of both the Penthouse and Honeymoon Suite are newly renovated with all new furnishings that fit the decor of St. John perfectly. Our favorite part about the Penthouse was the wrap around deck and unbelievable views. Not only were they great during the day but also amazing at night. There is even a lovely view from large the walk in shower. There is an AC in the bedroom for comfort but not really needed because of the cool breezes and windows everywhere. Seriously there was an amazing ocean view from every inch of this place! Another one of our favorite features was the daybed on the deck. I would recommend this place to anyone from a single couple to a group of couples looking for an awesome get a away. Brittany and Island Abodes were spectacular, we couldn't have asked for a better host. If you are new to the island she has all the info you want and need to have a wonderful vacation. We definitely plan on returning and staying here again. Hey Blair! Thanks for your glowing review and recommendation! It sounds as though you had everything you needed and were pleased with the accommodations and views, and nothing makes us happier. Robert and I really enjoyed having all of you as guests and we hope you'll be back soon to stay with us again. We'd love to have you! Thanks again. We arrived on November 11th with another couple of friends (who stayed in the Honeymoon Suite and the One-Bedroom Apartment). We really enjoyed everyone having private rooms, but could see each other when we wanted. We used our Penthouse as the common hang-out. The views were breathtaking...Cruz Bay and the nightlife was just in the distance, not to mention the school (which hosts the local concerts, etc.). We could see exactly what was going on a mile away, but couldn't hear the bars which was nice. The daytime views were breathtaking with rainbows two of the six days we were there. The stay was quiet when we wanted and the privacy was perfect as everyone had their own balcony if they wanted space. To paint a perfect picture....the Penthouse is the best of both worlds....it's private if you wanted or plenty of space for gathering. It was awesome to say the least and Brittany is a 5-star host! Hi Shane! Thanks so much for the awesome review of your stay in the Penthouse Suite at Sunset Serenade. 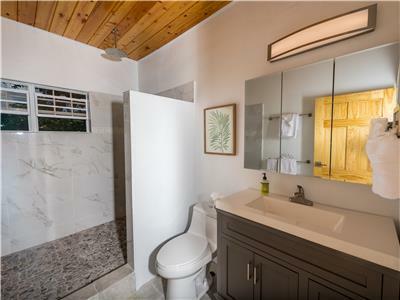 What a wonderful way to enjoy a St. John vacation, with friends right next door while also taking advantage of your private accommodations at times. 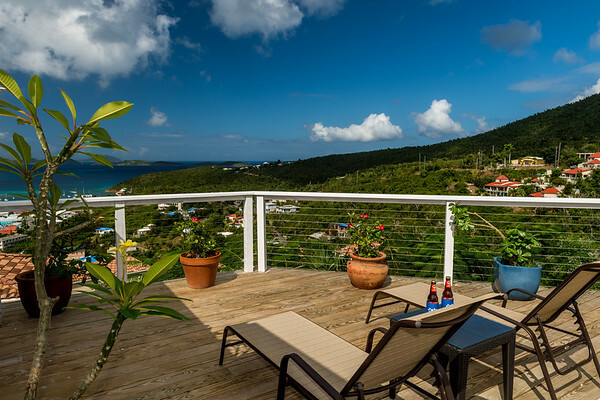 We absolutely love those gorgeous Caribbean views from the private deck, too! It sounds as though you really embraced island living. I'm happy to hear you found the location to be convenient to Cruz Bay, yet quiet and peaceful too. We hope to welcome you back to Island Abodes again soon! I can not say enough about the experience we had in St. John. We stayed in the luscious penthouse suite of Island Abodes property. The space was just perfect. Convenient and close to EVERYTHING! More than enough room for two and plenty of room for a few extra visitors if you wanted to entertain. My favorite spot was the balcony. The view was stunning!! Beautiful, mountainous ocean views with iguanas sunbathing on tree limbs just before your eyes. There were an array of plants and flowers amongst us all around. Covered porch as well as a sunbathing deck with a cabana daybed. HEAVENLY! 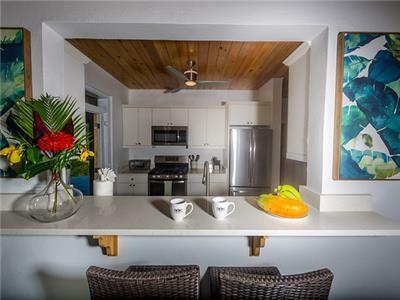 The interior decor was simple and fitting to island life. King size bedroom with AC, Kitchen, fridge, coffee maker etc and even a living room with a lounge pull out couch. All the amenities were there for you, not to mention the helpfulness from the owners, Robert and Brittany. Every question had an answer. 5 star for sure. Highly recommended for your future stay. Surrounding island abodes also allow for other accommodations of friends and/or family to be near one another but still have their own space. Wow, what an awesome review Lara - we can't thank you enough! Robert and I truly enjoyed reading your feedback and it made us so happy to hear your stay with us exceeded your expectations and that you plan to return! Thanks for your kind words regarding the accommodations, decor and deck - it'll all be waiting for you when you come back to the island. We look forward to seeing you! St John is a lovely, small island with great beaches, snorkeling, hiking, and good food and drinks. Family of 4 with two teenage daughters rented the Penthouse in Cruze Bay through Brittany and Robert. Great location. Awesome view from large deck. Very comfortable unit. Brittany met us the first night, and was readily available whenever we had questions or needed assistance, and had great island recommendations. Would rent from her again! Thanks for your review and for your kind words regarding both St. John and your recent stay at the Penthouse at Sunset Serenade! It was a pleasure meeting your whole family, and Robert and I really enjoyed having you as guests! We loved reading that y'all enjoyed the deck, the views, and the convenient location. It sounds as though you enjoyed your time away from the Penthouse exploring the island as well, and I was happy to help with some of my favorite recommendations! We want our guests to love St. John as much as we do, so we're happy to be there to ensure your whole family has a good time! We hope to welcome you back and thanks again. Happy New Year! First of all, Brittany from Island Abodes is an amazing host. She was was very informative in recommending things to do and see, places to eat, etc. She even picked us up and dropped us off at the ferry! The Penthouse is top notch! 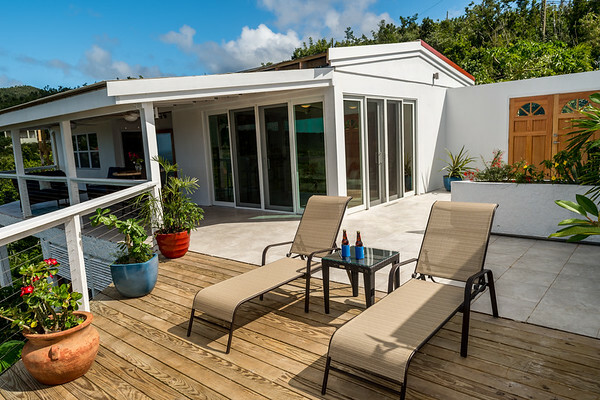 There is a large deck with lots of comfortable seating to enjoy the great views of Cruz Bay and St Thomas. Inside you will find it clean, airy, and spacious! There is an AC in the bedroom but we never needed to use it since the breeze from the open windows and ceiling fans was perfect for us our entire stay. We can't wait to come back! We will be recommending this rental to our family and friends and hopefully for our next trip we will be coming with others who can stay in some of the other units on the property! Thanks for your kind words and for taking the time to post a review on VRBO! It was my pleasure to pick you up, provide recommendations, and ensure you got the most out of your trip to this beautiful little island we call home. We want to always ensure our guests have everything they need, and that includes suggestions for things to see and do as well! Robert and I were very pleased to hear that you found the Penthouse clean, spacious, and well-equipped. And we were even more pleased to hear you plan to stay with us again and will be recommending us to your friends and family. We can't thank you enough Paul! You were a great guest and we look forward to seeing you again! Great Accommodations, Beautiful Views, and Wonderful Hosts! As this was our first trip to St John's, we had no idea where to stay. As luck would have it we ended up at Island Abodes and were fortunate to stay in the Penthouse. The accomodations were top notch. A beautiful living room, complete kitchen and a very relaxing large bedroom. Even the shower had a view of the island. 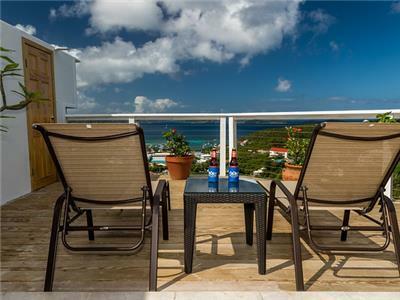 Add to all of this the large deck overlooking Cruz Bay, and you have a great place at a very reasonable price. Close to town and beaches so you can take it all in and have a great experience. Brittany and Robert are great hosts. They make every effort to assist you during your stay, while still giving you space. They are literally only a text or phone call away. They have worked very hard to create a slice of paradise that we will definitely come back to again. Thank you for your review Chris! 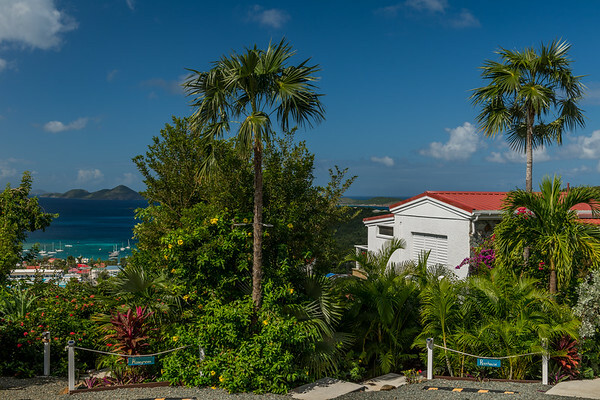 We were delighted to hear that your stay with us exceeded your expectations and especially that you plan to stay with us again when you return to St. John! We wanted to ensure you guys had the best first trip to the island as possible, and it sounds as though you truly enjoyed your stay. Thank you for your kind words regarding our availability to you, and the Penthouse and its amenities.. you'll have to try one of our other beautiful Island Abodes properties next time! Thanks again for your review and for taking the time to post it to VRBO! I had the privilege of staying at the Penthouse and enjoyed every minute of my stay. Brittany was a pleasure to interact with and very kind with details as well as hospitality. Hi Timothy, thanks so much for posting a review on VRBO! It truly was my pleasure to assist you and provide recommendations for you during your stay. We take pride in ensuring our guests are well informed and happy, and we want to do everything possible to make sure you leave feeling content and relaxed. Thank you again and we hope to welcome you back soon! The Penthouse met all of our expectations and more! Thank you for sharing your feedback and for taking the time to post such an awesome review! It means so much to us that despite having stayed in many different beautiful villas on St. John, that the Penthouse exceeded your expectations. Robert and I loved having you and your adorable family and it was our pleasure to make sure everything was ready for your late night arrival. As you said, we just want to ensure our guests have the best time possible and that they already have everything they need already waiting. Again, thank you so much for this lovely review. It made us happy to read it and we hope to see you, Melissa and Reese again real soon! My stay in the penthouse at island abodes was outstanding!!! It was by far the best and most accommodating experience I have encountered when staying in any place across the world. The penthouse was clean, comfortable, welcoming, and had the most beautiful views anyone could ask for. Robert and Brittany exhibited a warm welcome and made everything feel at home. They were there for any and every question that needed answers :-) I will DEFINITELY return and choose no other place than island abodes!! I highly recommend this place to anyone who is looking for an amazing experience on St. John!! Thank you guys so much for your review! It was so great to see you again and we can't thank you enough for choosing Island Abodes for your vacation to St. John. Robert and I truly do our best to make sure our guests enjoy their stay to the fullest, and that they leave feeling relaxed and refreshed. Thank you again for posting a review to VRBO and sharing your experience with future guests. We appreciate the recommendation and would love to have you back anytime! Take care! We had a wonderful 1 week stay at the Penthouse on St. John. Robert and Brittany were amazing hosts and provided us with wonderful information about the island. The penthouse was clean, lovely and welcoming. We immediately fell in LOVE with the amazing view and settled in within minutes. At one point during our stay, we managed to lock ourselves out of the apartment and Brittany was able to send someone to rescue us within minutes! The apartment was well appointed and had everything we needed for a week' s stay. We really couldn't have asked for a better location, accommodations or hosts! Thank you Brittany and Robert! We hope to return to STJ soon for another visit and stay and we will definitely recommend Island Abodes to our family and friends!! Thank you Cortney and Kirk! We really appreciate your wonderful review and recommendation. It sounds as though you guys had a great stay, despite being locked out of the Penthouse briefly! I was happy to provide rescue :) We were pleased to read that you found the property to be clean, comfortable and welcoming. The view is our favorite part as well so we're glad you enjoyed it so much. Thank you again for sharing your feedback for future Island Abodes guests. 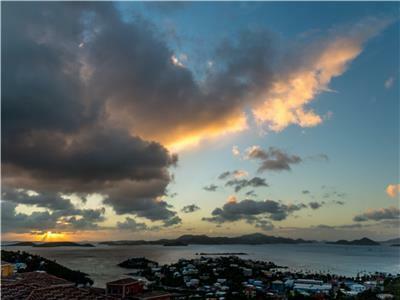 We too hope you'll return to St. John and we'd love to provide you with another great stay! My wife and I had a wonderful stay in the Penthouse, the porch was a favorite to hang out on, with a fantastic ( As I call it $10 mil view) of Cruz Bay, with magnificent sunsets. First lets give credit to Brittany who really puts her effort in to make you feel welcomed and comfortable. She met us at the dock and took us to pick up supplies at the market. The Penthouse is equipped with all your basic needs and offers a unique feel then being in a hotel. Kudos to Brittany and Robert for putting the effort in to make this a nice getaway and adding personal touches. Thank you for your review and 5 stars! It sounds as though you and Carrie thoroughly enjoyed your time at the Penthouse, and nothing makes us happier! Thanks for your kind words regarding the service you received at Island Abodes and the efforts to ensure you leave feeling refreshed and relaxed. It was no problem to pick you guys up from the ferry dock and help you feel comfortable upon arrival and well-equipped to enjoy your vacation! That's what we're here for. We appreciate your feedback and hope to welcome you back soon! Hi again Jamison and Ashley! Thank you so much for sharing your feedback on VRBO and congratulations again on your recent wedding! It was honestly our pleasure to host you and to ensure Ashley was both comfortable and happy on her way to and from the salon and to your ceremony. That's what every bride deserves! You guys were such great guests and we'd love to have you back anytime. Thank you for choosing Island Abodes and for taking the time to post a review. We'll see you soon.. perhaps for your one year anniversary?! :) Take care! We truly enjoyed our lovely Penthouse . Absolutely stunning views and a wonderful porch to enjoy. The owners, Brittany and Robert, provided all pertinent information needed for us to enjoy our stay. When we lost water due to an overnight power outage, they responded right away. 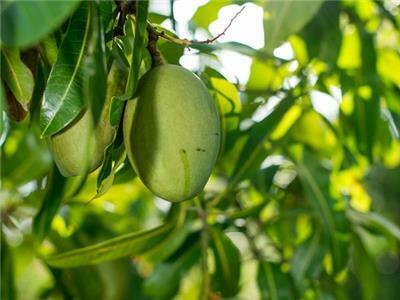 We even had fresh papaya from one of the trees on the property! We do love to cook and found that utensils needed for cooking were lacking.We used the air conditioning at night for sleep. We lost power for several hours over night and only one window could fully open. It would have been very comfortable sleeping without AC if we were able to open all the windows. Also, it would definitely help to have some sort of sun shades to pull down during the day for the living room floor to ceiling windows. The breeze and fans worked well to keep this area cool but shades would speed up cooling in the evening. These are very minor issues. We were very comfortable and wil not hesitate to recommend this beautiful property to our friends. My wife & I celebrated our anniversary in the Penthouse and had a terrific stay! We spent our time visiting the beaches of St John during the day and coming "home" to the Penthouse to relax and have dinner on the porch. The view of Cruz Bay and the islands in the distance is simply amazing! The Penthouse is clean, nicely equipped and perfect for our stay. Brittany and Robert were great hosts. The washing machine broke before our arrival and Robert was able to replace it one day while we were at the beach. Great customer service... thank you! We look forward to our next visit to the Penthouse and St. John. Thanks again! Thank you for the great review Jim, and again, Happy Anniversary! We were honored to host you and your lovely wife during your special stay, and we were happy to hear that you had such a wonderful time. We would like to apologize again for having to repair the washing machine during your stay, but we did our very best to ensure it didn't inconvenience you, and we appreciate you recognizing that and sharing your positive experience for future guests. Thanks again, and we hope to see you next year for your next anniversary! We'd love to have you anytime! Couldn't be happier with our stay! Brittany and Robert's Sunset Serenade was the perfect place for my girlfriend and me. To start, we were provided with detailed info about the villa and St. John well before we arrived. Throughout our stay, Brittany provided various tips, recommendations, etc. The villa (Penthouse) was spacious, well kept, and couldn't have provided a better sunset view. I would highly recommend The Penthouse at Sunset Serenade and any Island Abode property based on hospitality alone. Thanks so much Bo! Robert and I really enjoyed reading your review and we appreciate you taking the time to post about your stay on VRBO. We're so glad you guys enjoyed your stay, the stunning sunset view from the Penthouse, and the hospitality provided. We do our best to make sure our guests have the best time possible while on St. John, and we're just happy to hear that you had such a good time! Thanks again for the the review and recommendation - we hope to welcome you back to Island Abodes next time you're on St. John!